Yodfat is the famous site of the Roman siege on Josephus Flavius and his Galileen army in 67AD. This photo is from the north, where the Roman General Vespesian set up his HQ during the siege. War of the Jews 3, 6 36: "...Vespasian gave order that the city should be entirely demolished, and all the fortifications burnt down. " 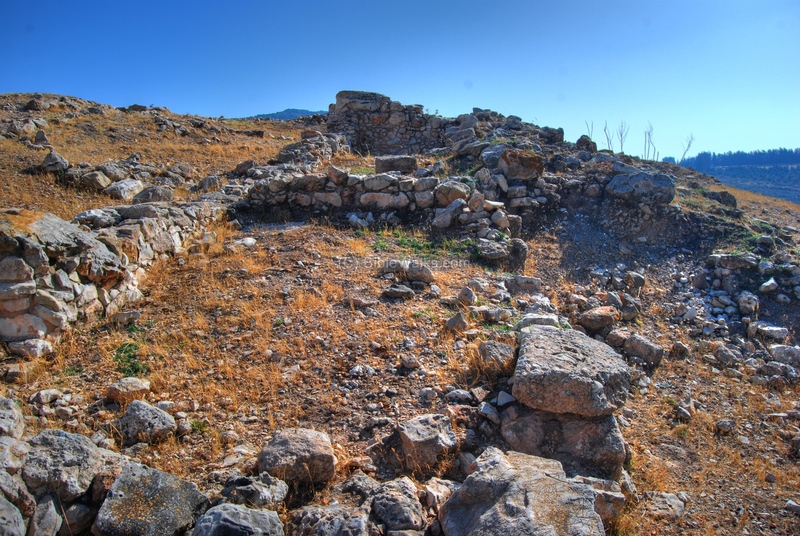 Yodfat (Jotapata) is the ruins of an ancient fortified village, the site where the famous siege at the time of the great revolt against the Romans. Josephus Flavius, then the northern commander of the revolting Israelites, stood up against the mighty forces under the command of Vespesian. After days of siege all the defenders committed suicide, but Josephus surrended himself to Vespesian and later became a writer of the Roman and Jewish history, and provided the details of the tragic story. 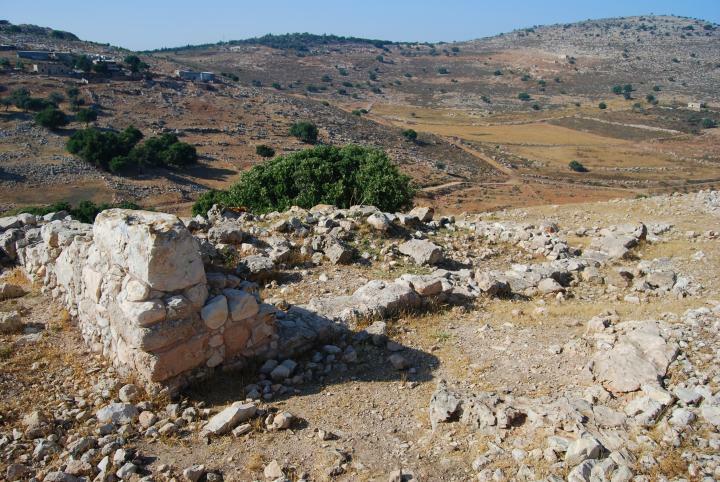 The site is located on a remote hillside at the edge of the Yodfat valley, which is 4 kilometers away from Khirbet Cana and the Netufa Valley. It can be approached from a new good paved road that starts from the junction of the road to modern Yodfat . The center of the ancient city lies on top of a steep hill (419M altitude, 50-100M above the valleys around it). It is dotted by caves, ancient cisterns and the remains of ancient buildings. 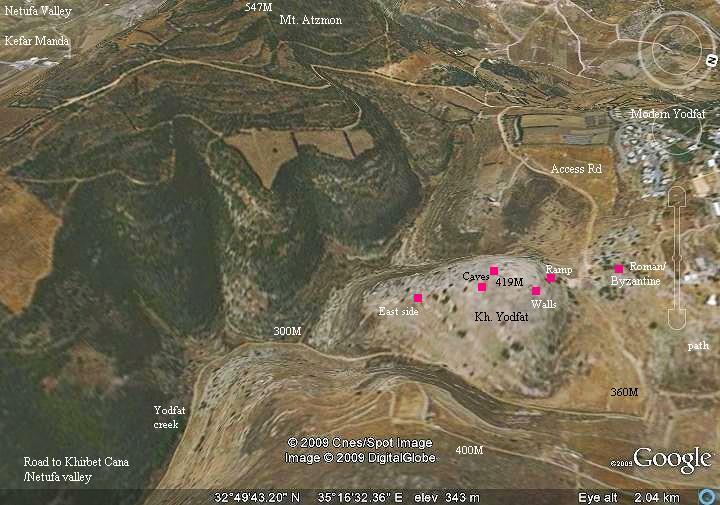 An aerial map below shows the hill of Yodfat in the center, indicating the major points of interest. You can point on the purple points to navigate to the selected point. 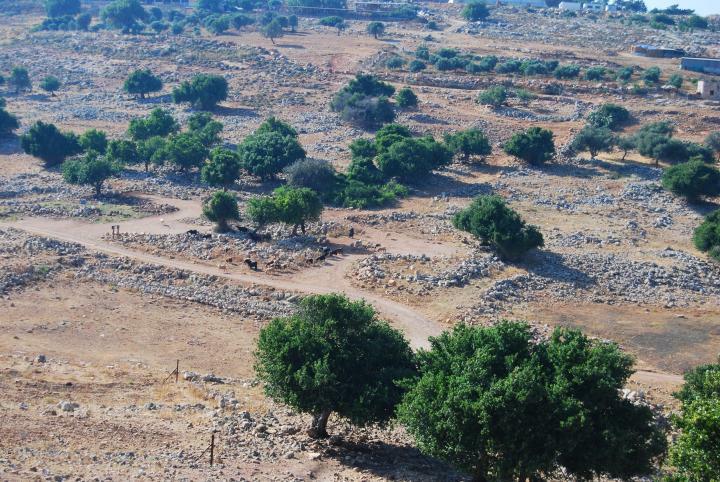 The site was settled during the Iron/Israelite period (1200-732BC), although few remains were left from that period. 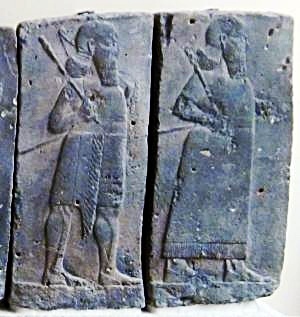 The city was probably destroyed in 732BC by the Assyrian King Tiglath-Pileser III, who annexed the area (as per 2 Kings 15: 29: "In the days of Pekah king of Israel came Tiglathpileser king of Assyria, and took ... Galilee...and carried them captive to Assyria"). 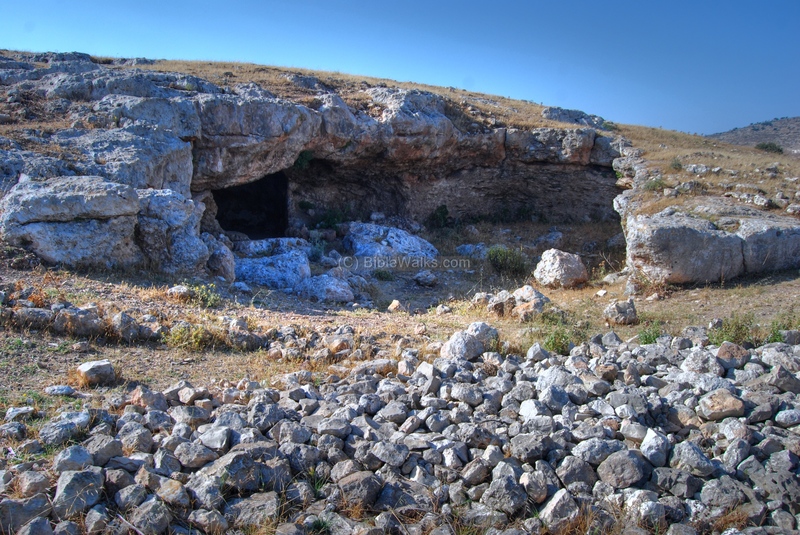 The list of exiles of the King includes a city called "[Ya]tvat", which may have been this site. 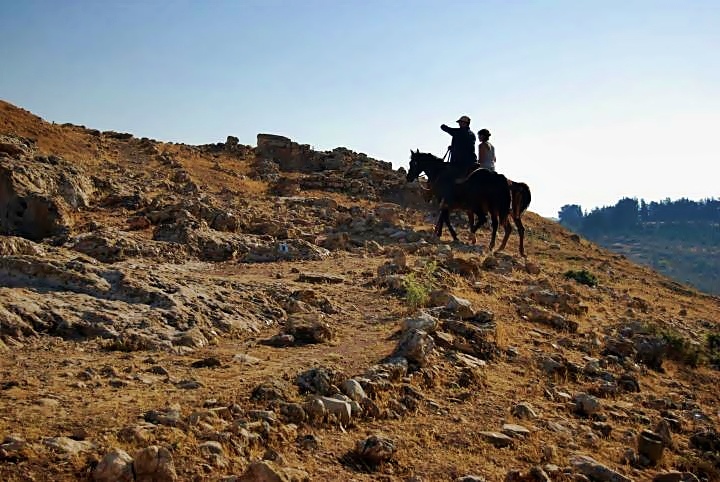 The village was repopulated at the Persian or Hellenistic periods. 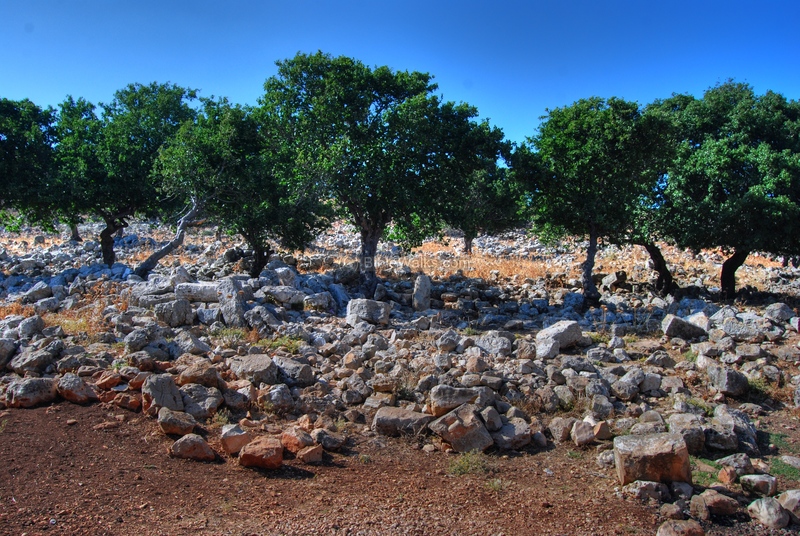 Yodfat was fortified by Josephus Flavius at the time of the great revolt against the Romans (see references). Its fame came from the siege laid by Vespesian at 67 AD, in the beginning of the Roman campaign to crush the Jewish revolt. The Roman legions managed to enter the fortified city after 47 days, and captured the last remaining person - the commander Josephus himself, while the rest of the defenders died or committed suicide. 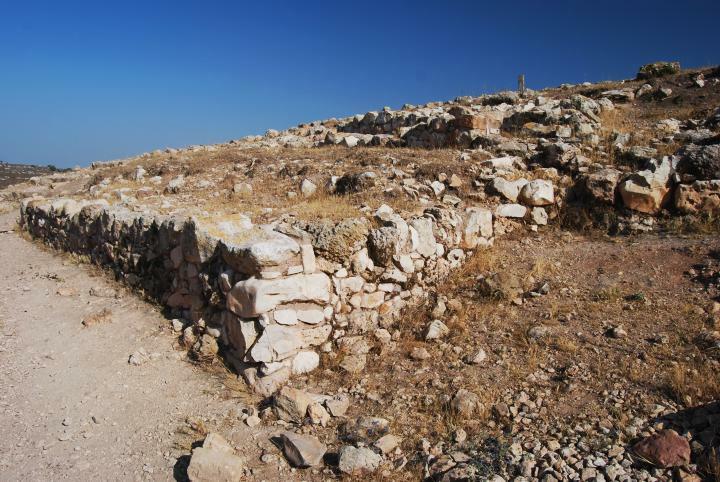 These accords resemble the tragic events of Gamla and Masada, and therefore Yodfat is often referred as the "Masada of the Galilee". After it was totally destroyed by the Romans, the site was allowed to be rebuilt, but on the facing unprotected hillside, since the Romans did not want this stronghold to be used again as a rebel fort. 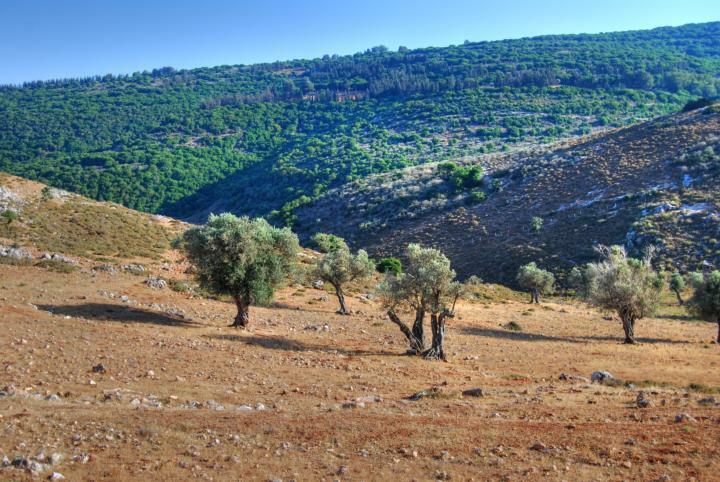 It was repopulated by Jewish refugees from Jerusalem, and flourished for another 300 years, and destroyed again. It was then left in ruins for yet another 1600 years, until it became a national park. 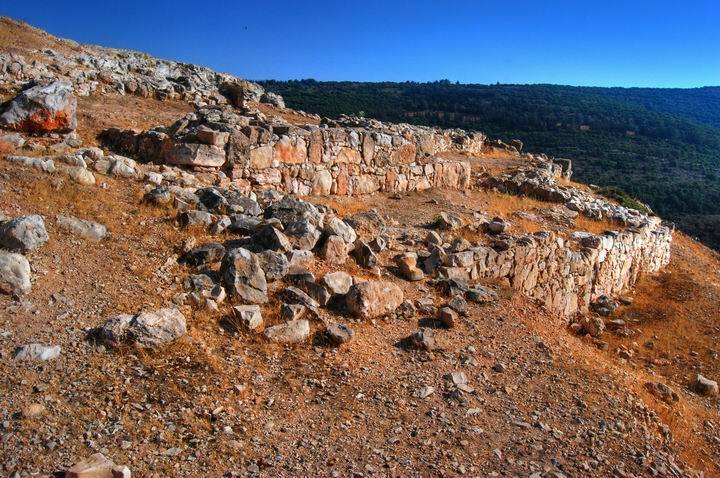 In recent years the site was excavated, and its fortifications, ramp and some of the buildings were dug out of the rubble. Dozens of arrows and ballista stones were found, proving at least some of Josephus's accounts of the siege and fall of the city. 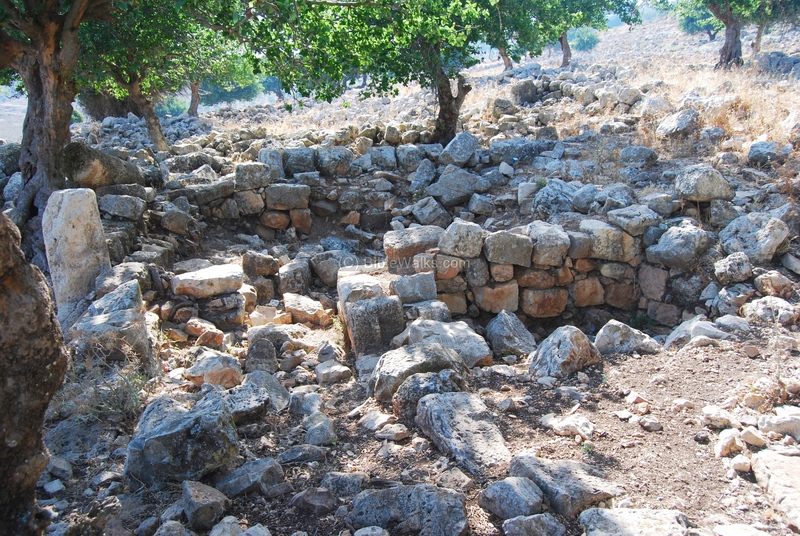 A modern community settlement was established in 1960 west of the ancient site, and called Yodfat. The photo below shows an aerial view of the site from the west, as captured by a quadcopter. On the top of the hill a set of caves can be seen, and just beneath it the walls of the fortress. In the center right the Romans built the ramp in order to crush the walls. Another aerial view from a higher altitude (60m) is seen next. Mt. 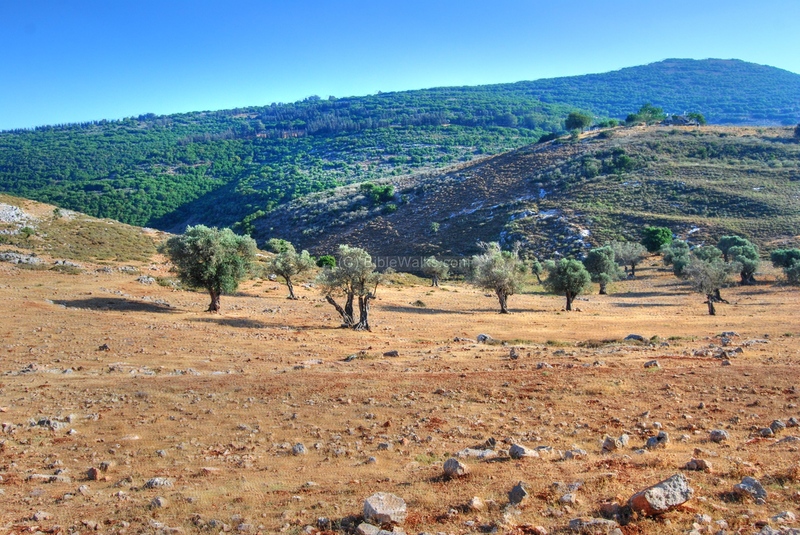 Atzmon is the high hill behind Yodfat. A ground-level view from the south-west side is seen below. The hill is steep around all sides. 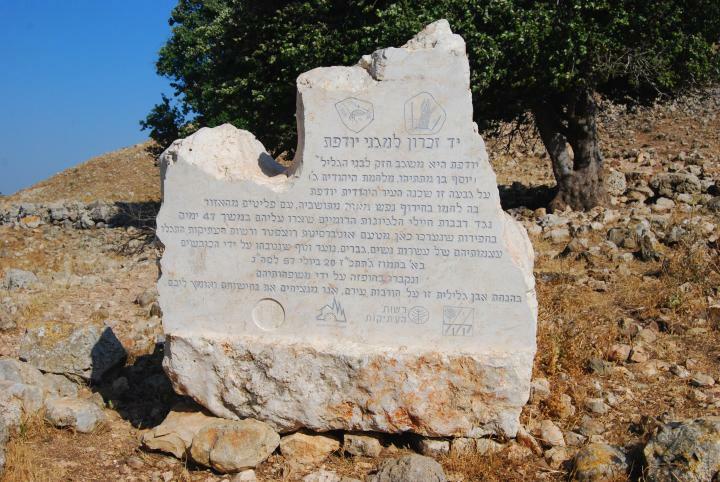 It presented a challenge to the thousands of Roman soldiers who surrounded the fortress, facing a group of hundreds of Jewish zealots who assembled in this last fortress, willing to die in order to defend their newly independent country. 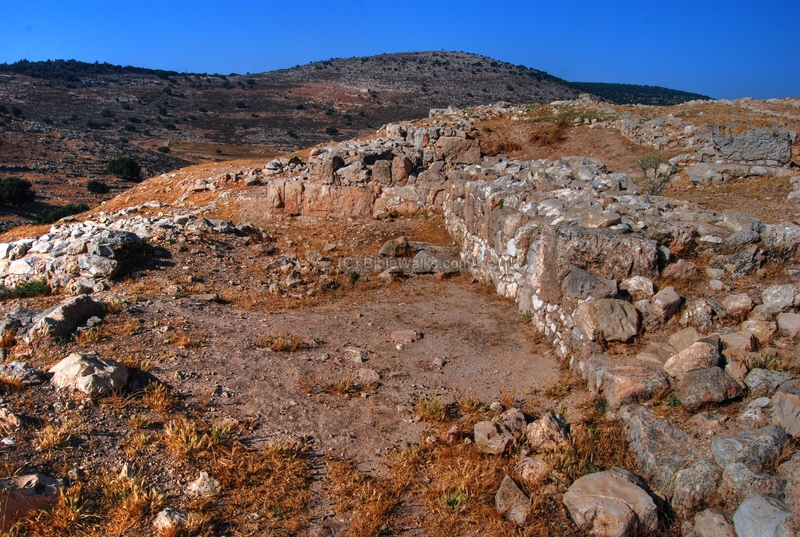 The Romans built a siege ramp on the western side, seen in the photo below. 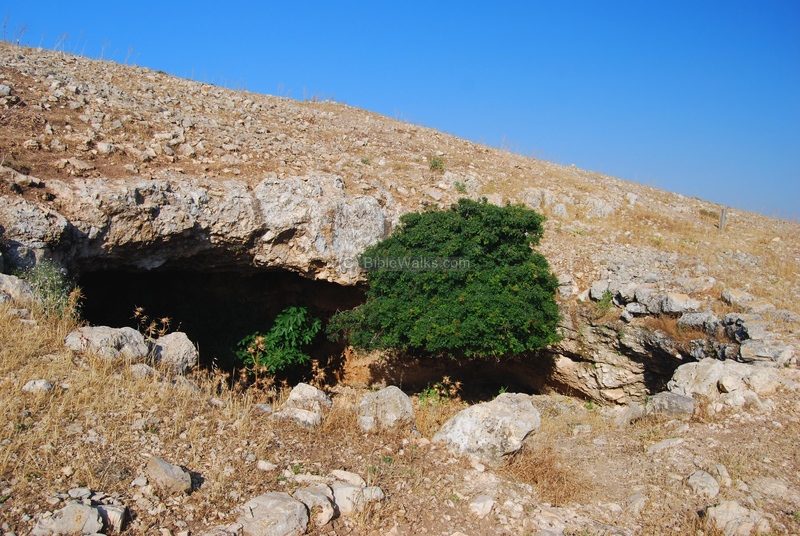 They reached the fortifications on the top of the hill only after 47 days. They managed to overcome the resistance, killing all men except for the commander, Josephus Flavius, who survived and wrote about the famed war against the Romans. The slope at the middle of the steep ramp is covered by thousands of pieces of Hellenistic and Roman ceramics. 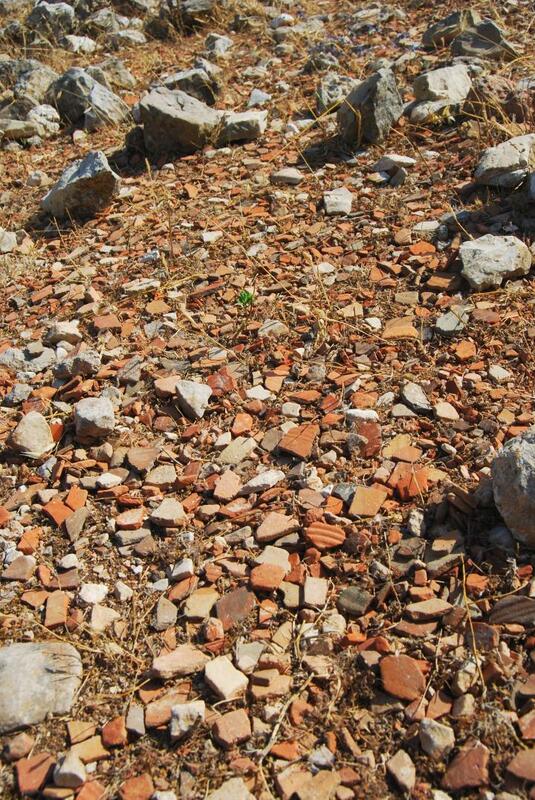 This extraordinary concentration of fragments may have been a result of the excavations on top of the hill. There is a trail that you can walk up the slopes, surround the round Tell, and come back on the south side. 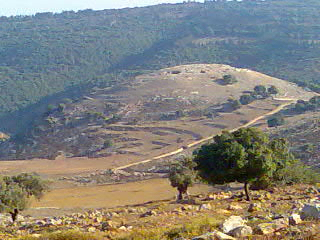 This trail is seen on the upper right side, close to the top of the hill on its north side. 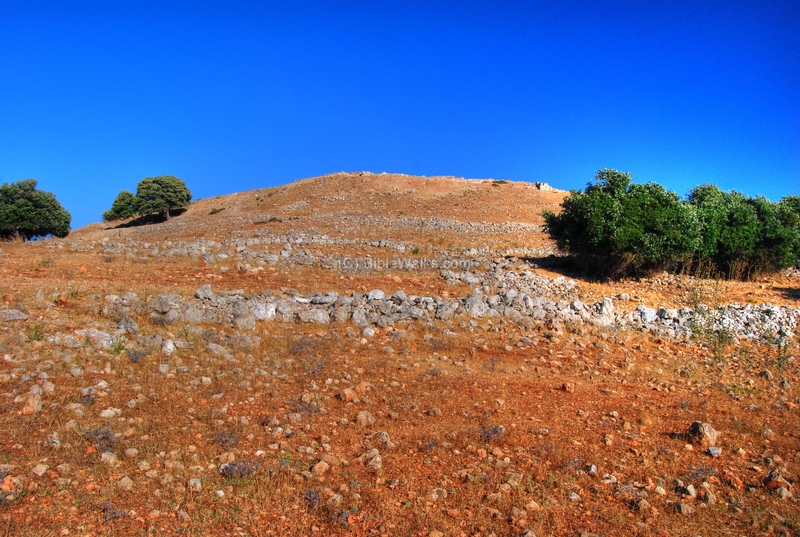 At the top of the hill are the foundations of the walls, built by the Army of the rebels in anticipation of the Roman invasion. These walls are located on the north side, where the trail reaches the top. Along the ridge are more sections of the wall. It is a double wall "casemate" type, which extends from north-west side to the middle of the western side of the Tell. Other sections of the wall are seen below. This section was the side where the siege ramp was built by the Romans, and the defenders fought over the wall under a rain of arrows and stones by the Roman troops below. 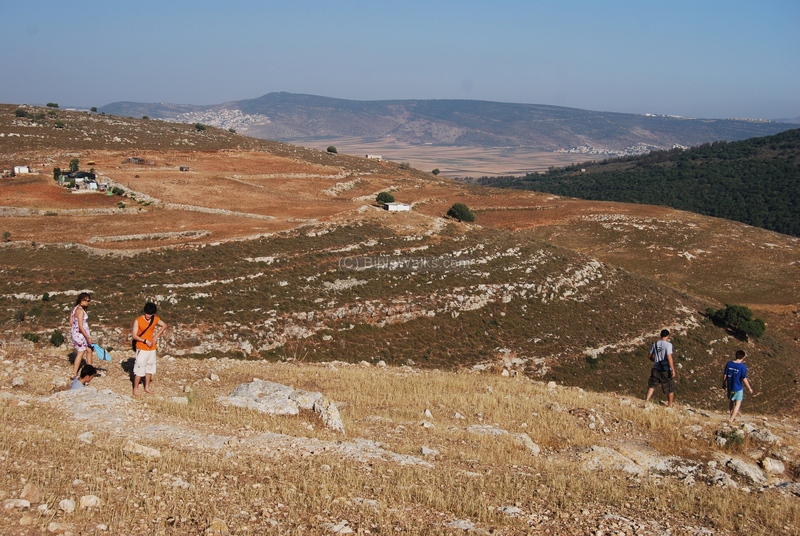 In the far background is the hill called Atzmon (548M), where thousands of Jews fled away from the Roman troops but were eventually butchered. Another section of the double wall "casemate" type on the south-west side is seen below. More views of the fortifications, with a view towards the north. 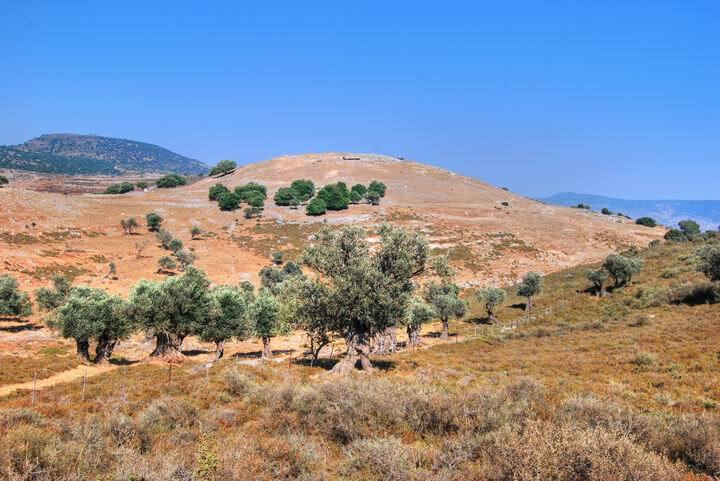 The tens of thousands of Roman soldiers were camped on the hillsides on the background, completely surrounding the site. This is the view of the north-west side. The rebels were hiding behind this wall in July 67, watching the Roman soldiers who were stationed on the hillsides, tossing spears, stones and arrows with their mighty war machines. The war was conducted in the dry summer. Where did the hundreds of defenders get their water from? Where was their shelter? Walking around the top of the hill you can see the answer to these questions: the hill is pocketed with dozens of small and large caves, some of them interconnected, and many cisterns full of water. 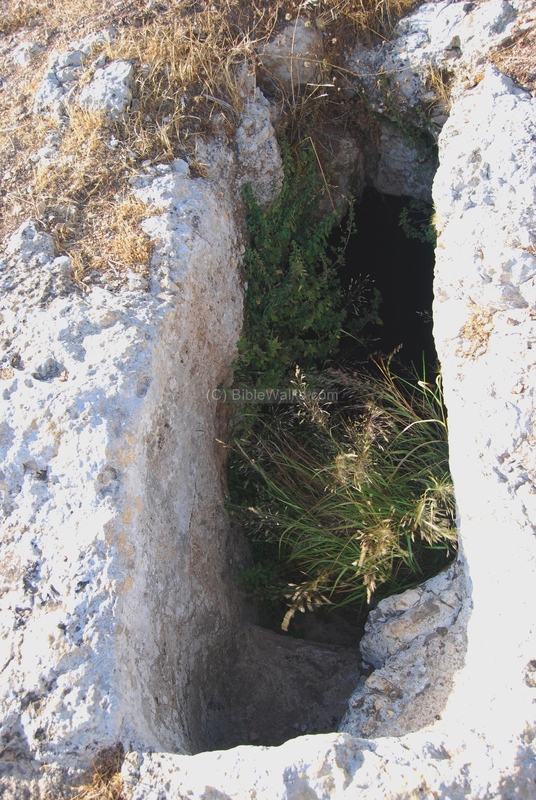 The photo below shows one of the entrances to the water reservoirs and ritual baptismal. A staircase cut into the rock leads to the water reservoir below. The exterior wall of the water reservoir, seen below, has collapsed. This allows us to see how the flight of stairs descended down into the bottom of the cistern. The stairs allowed easy access for bathing and filling up the water jugs. Where did the water come from? 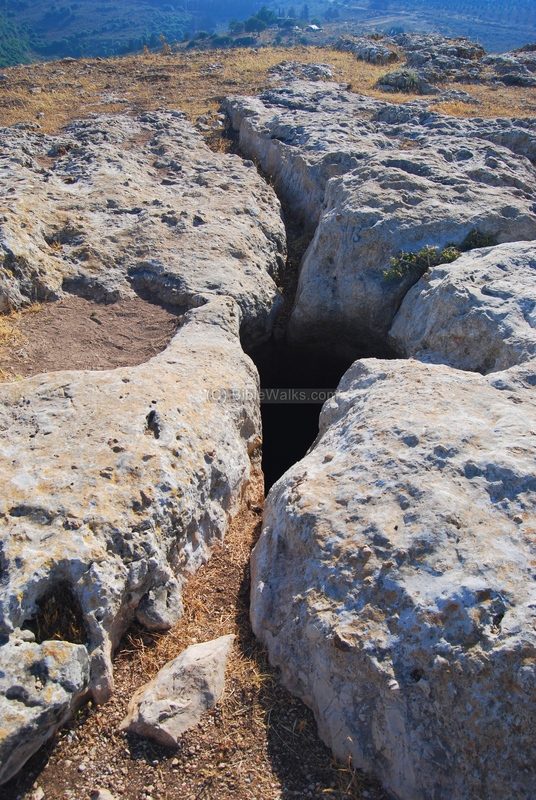 The photo below shows grooves that were cut into the rock bed from different sides, directing the winter rain to fill up the cistern. 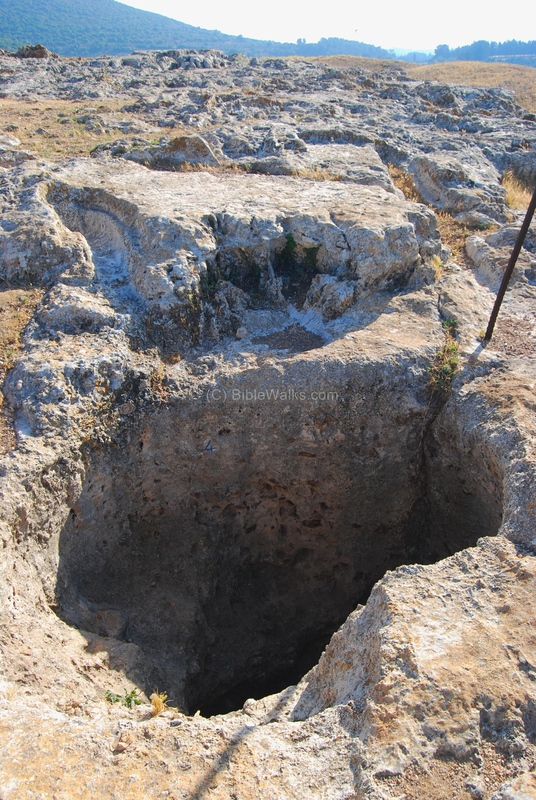 These waters were stored in the reservoirs, and used during the dry spring and summer season. 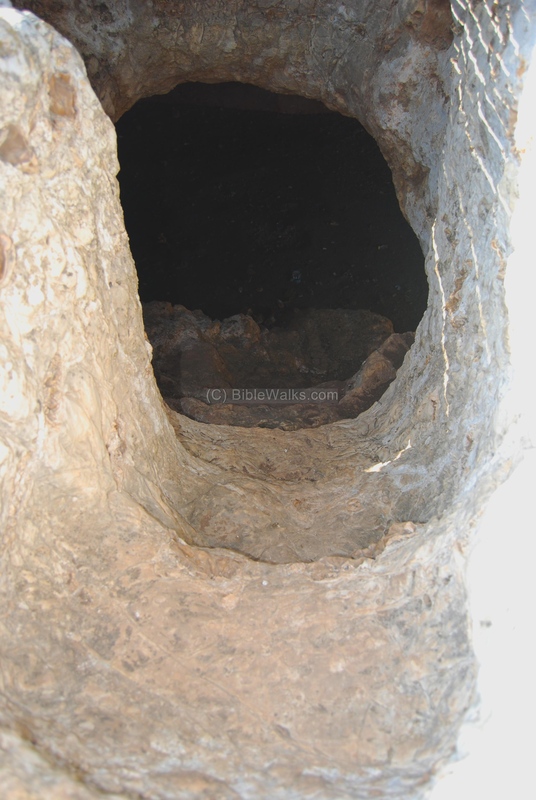 In June, we found the water cisterns completely full of water. The young group seen below came with bathing suits to enjoy a cool swim in one of these water reservoirs. They later toured the site and listened to the stories about the courage of the defenders and the tale of their bitter end. Another flight of steps is seen below. The water is directed into the cistern to fill it up during the winter season. 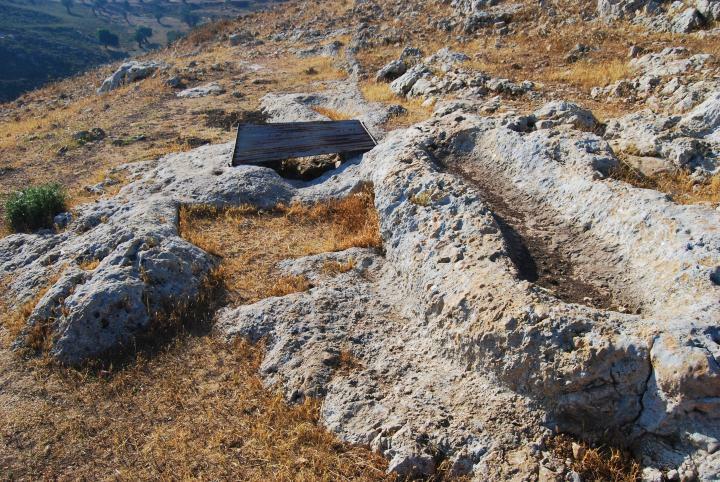 On other parts of the hill, such as in the south side seen below, there are many other cisterns with rock hewn water buckets that are filled up to water the cattle and sheep. Yet another one of the caves, located on the south side. 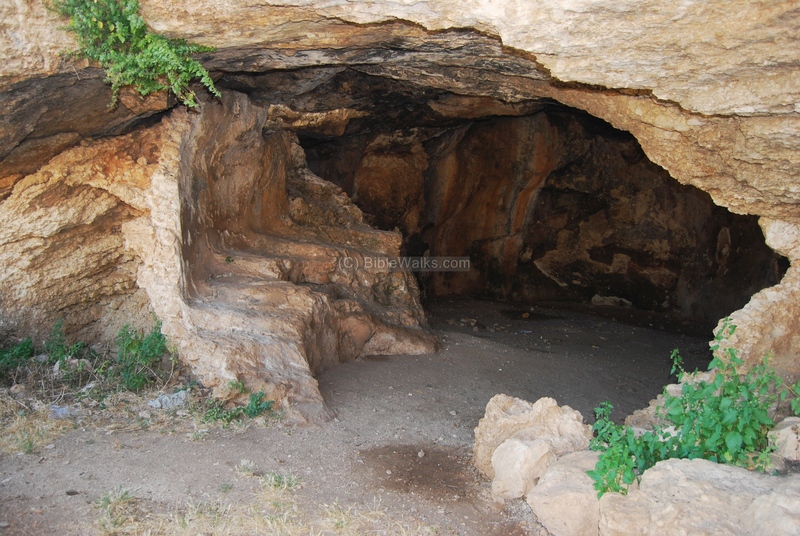 In one of these caves the 40 last men hid together with the rebel commander, Josephus. They remained there hiding for 3 days, but were the Romans found about it. All his men committed suicide, but Josephus alone was taken prison and is spared by Vespesian. This is fortunately, since he became the famous writer of the War against the Romans and allowed us to get acquainted with the tragic events in the site and the rest of the country. 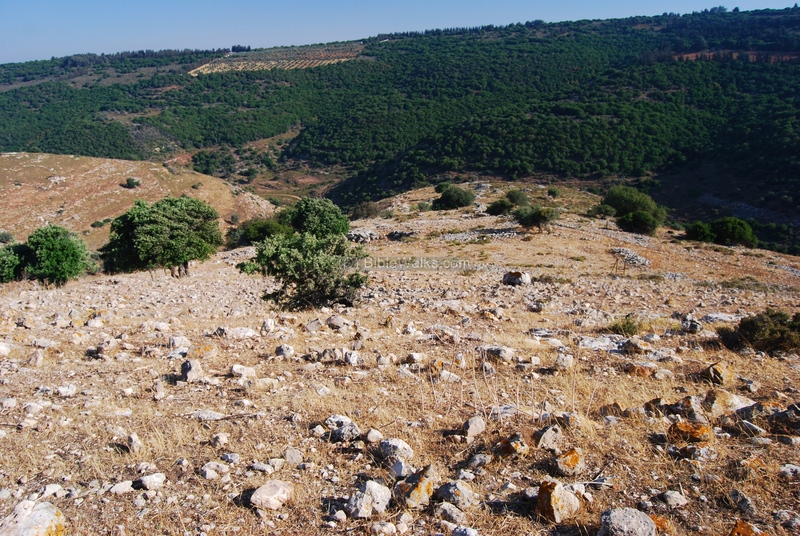 The eastern side of the hill has a long ridge that extends beyond the hill, but is also surrounded by the deep canyons on both sides. 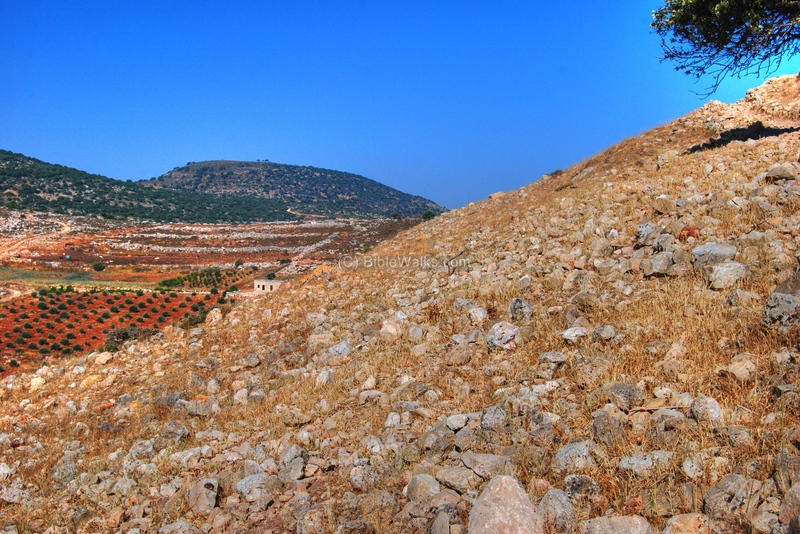 A dirt road passes from the canyon, down to Khirbet Cana (the site of Jesus first miracle) and to the Netufa valley seen in the far background. Through this road the Roman army walked up to the site. The eastern ridge was also defended by a wall that surrounded it by all sides. The traces of ruins are visible in the photo below. 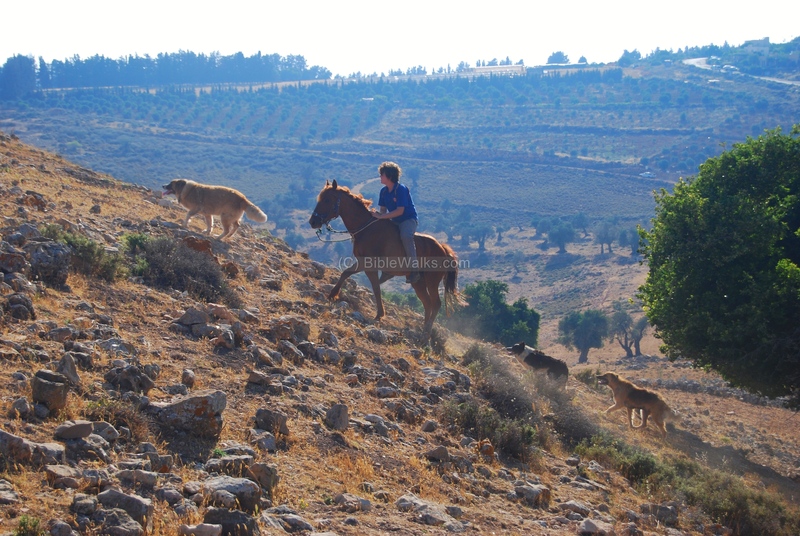 During our visit to the site a group of riders came up the hill on their horses and followed by their dogs. In the photo below the riders pass the western fortifications on the top of the hill. 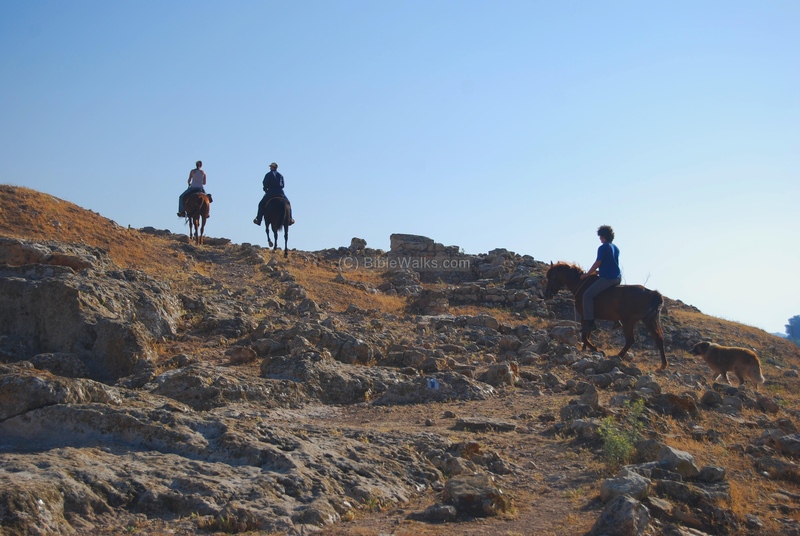 The third rider follows them, climbing up the steep hillside where the battering ram was pulled up by the Romans. Another view of the riders, passing near the western fortifications. On the western slopes of the hill, and especially on the hillside facing the hill, are large traces of ruins from a period after the fall of Yodfat/Jotapata. The photo below shows a shepherd with his goats in the center of the photo, moving through these ruins. Some of the walls of the houses were partially restored, as in the photo below. 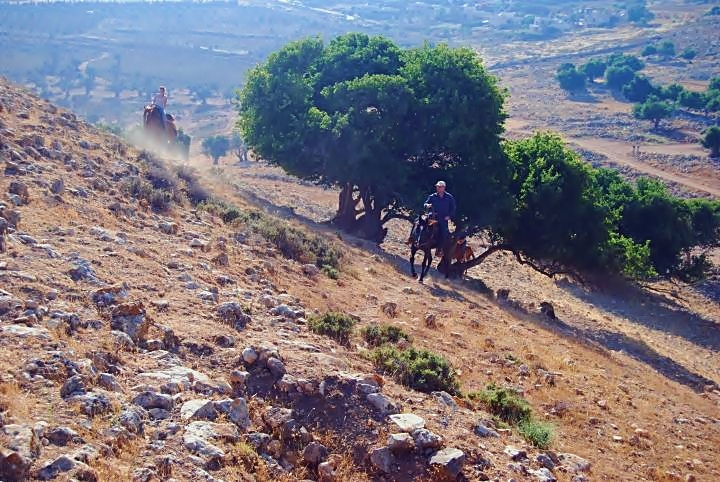 Around the site are beautiful Galilean views, such as the slopes on the south side of the hill. 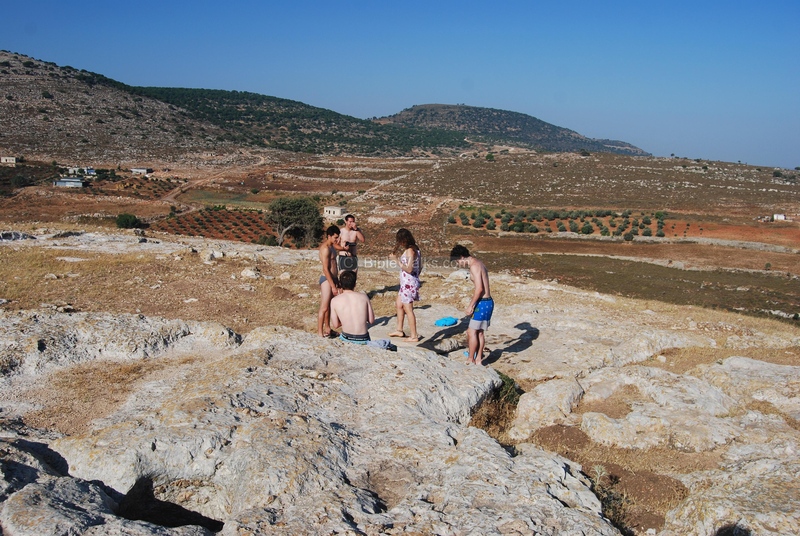 In the background is the hill of Atzmon. A closer view of the olive trees in that hillside. "Amon was twenty and two years old when he began to reign; and he reigned two years in Jerusalem; and his mother's name was Meshullemeth the daughter of Haruz of Jotbah".
" Josephus also, when he had settled these rules for determining causes by the law, with regard to the people's dealings one with another, betook himself to make provisions for their safety against external violence; and as he knew the Romans would fall upon Galilee, he built walls in proper places about Jotapata, and Bersabee, and Selamis"
"Now Jotapata is almost all of it built on a precipice, having on all the other sides of it every way valleys immensely deep and steep, insomuch that those who would look down would have their sight fail them before it reaches to the bottom. It is only to be come at on the north side, where the utmost part of the city is built on the mountain, as it ends obliquely at a plain. 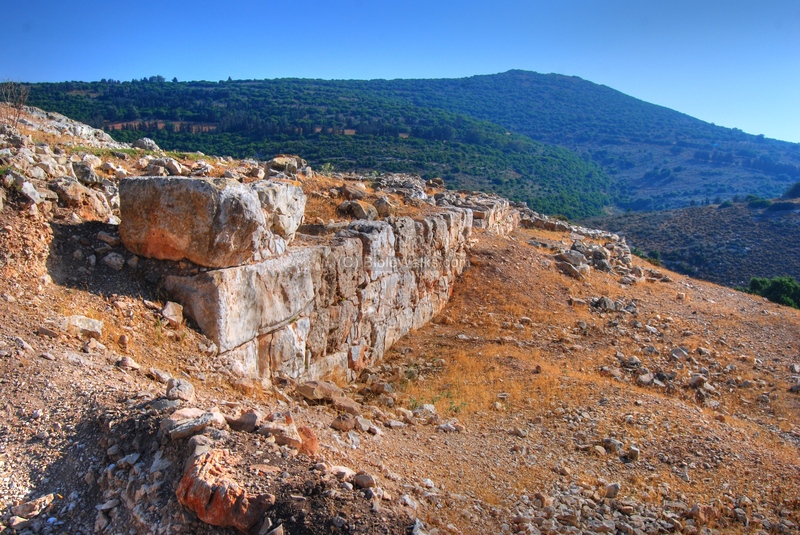 This mountain Josephus had encompassed with a wall when he fortified the city, that its top might not be capable of being seized upon by the enemies. The city is covered all round with other mountains, and can no way be seen till a man comes just upon it. And this was the strong situation of Jotapata". "But when Placidus, who had overrun Galilee, ... he marched furiously against Jotapata, which was of them all the strongest, as supposing he should easily take it by a sudden surprise..."
"Vespasian, therefore, in order to try how he might overcome the natural strength of the place, as well as the bold defense of the Jews, made a resolution to prosecute the siege with vigor...."
"...Vespasian then set the engines for throwing stones and darts round about the city...."
"...And when the bank was now raised, and brought nearer than ever to the battlements that belonged to the walls, Josephus thought it would be entirely wrong in him if he could make no contrivances in opposition to theirs, and that might be for the city's preservation; so he got together his workmen, and ordered them to build the wall higher..."
"Now the besieged had plenty of corn within the city, and indeed of all necessaries, but they wanted water, because there was no fountain in the city, the people being there usually satisfied with rain water; yet is it a rare thing in that country to have rain in summer, and at this season, during the siege, they were in great distress for some contrivance to satisfy their thirst; and they were very sad at this time particularly, as if they were already in want of water entirely, for Josephus seeing that the city abounded with other necessaries, and that the men were of good courage, and being desirous to protract the siege to the Romans longer than they expected, ordered their drink to be given them by measure; but this scanty distribution of water by measure was deemed by them as a thing more hard upon them than the want of it; and their not being able to drink as much as they would made them more desirous of drinking than they otherwise had been; nay, they were as much disheartened hereby as if they were come to the last degree of thirst." "When, therefore, Vespasian looked upon himself as in a manner besieged by these sallies of the Jews, and when his banks were now not far from the walls, he determined to make use of his battering ram. This battering ram is a vast beam of wood like the mast of a ship, its forepart is armed with a thick piece of iron at the head of it, which is so carved as to be like the head of a ram, whence its name is taken. This ram is slung in the air by ropes passing over its middle, and is hung like the balance in a pair of scales from another beam, and braced by strong beams that pass on both sides of it, in the nature of a cross. When this ram is pulled backward by a great number of men with united force, and then thrust forward by the same men, with a mighty noise, it batters the walls with that iron part which is prominent. Nor is there any tower so strong, or walls so broad, that can resist any more than its first batteries, but all are forced to yield to it at last. This was the experiment which the Roman general betook himself to, when he was eagerly bent upon taking the city; but found lying in the field so long to be to his disadvantage, because the Jews would never let him be quiet. So these Romans brought the several engines for galling an enemy nearer to the walls, that they might reach such as were upon the wall, and endeavored to frustrate their attempts; these threw stones and javelins at them; in the like manner did the archers and slingers come both together closer to the wall. This brought matters to such a pass that none of the Jews durst mount the walls, and then it was that the other Romans brought the battering ram that was cased with hurdles all over, and in the tipper part was secured by skins that covered it, and this both for the security of themselves and of the engine. Now, at the very first stroke of this engine, the wall was shaken, and a terrible clamor was raised by the people within the city, as if they were already taken". "...But as the people of Jotapata still held out manfully, and bore up tinder their miseries beyond all that could be hoped for, on the forty-seventh day [of the siege] the banks cast up by the Romans were become higher than the wall; on which day a certain deserter went to Vespasian, and told him how few were left in the city, and how weak they were..."
"...and it was Titus himself that first got upon it, with one of his tribunes, Domitius Sabinus, and had a few of the fifteenth legion along with him. So they cut the throats of the watch, and entered the city very quietly. After these came Cerealis the tribune, and Placidus, and led on those that were tinder them. Now when the citadel was taken, and the enemy were in the very midst of the city, and when it was already day, yet was not the taking of the city known by those that held it; for a great many of them were fast asleep, and a great mist, which then by chance fell upon the city, hindered those that got up from distinctly seeing the case they were in, till the whole Roman army was gotten in, and they were raised up only to find the miseries they were under; and as they were slaying, they perceived the city was taken. "And on this day it was that the Romans slew all the multitude that appeared openly; but on the following days they searched the hiding-places, and fell upon those that were under ground, and in the caverns, and went thus through every age, excepting the infants and the women, and of these there were gathered together as captives twelve hundred; and as for those that were slain at the taking of the city, and in the former fights, they were numbered to be forty thousand. So Vespasian gave order that the city should be entirely demolished, and all the fortifications burnt down. And thus was Jotapata taken, in the thirteenth year of the reign of Nero, on the first day of the month Panemus [Tamuz]". Josephus and 40 of his men hide in one of the caves for 3 days, but a woman reveals this to the Romans. All his men commit suicide, but Josephus alone is taken prison and is spared by Vespesian. He later accompanies the Roman army in its conquest of Israel, and writes about it in his books.